LAHORE: NOV 11,2018- Prime Minister Imran Khan says the government will soon launch a comprehensive poverty alleviation program in the country. 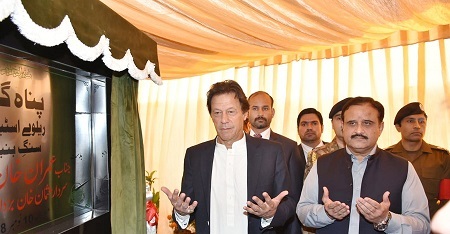 He was addressing the groundbreaking ceremony of Shelter Home project for the people, who spend their nights under the open sky, in Lahore on Saturday. He said five sites have been allocated for establishing Shelter Homes for the homeless people, and he will also ask for setting up such shelters in Rawalpindi, Peshawar and Karachi. The Prime Minister said the country has come out of the crisis of repayment of loans owing to the strenuous efforts of the government during the last two months, and now all efforts will be put in for initiating public-welfare projects. Responding to a question, the Prime Minister said the government wants supremacy of the law in the country. He said the government stands with the Supreme Court decisions and there will be no compromise on it. The Prime Minister said the verdicts of the Supreme Court will be enforced with letter and spirit. He said the founder of Pakistan had envisioned a welfare Muslim state where all citizens can enjoy equal rights regardless of creed, ethnicity, race, language and gender. He praised the performance of the chief minister Punjab Sardar Usman Buzdar and lauded the efforts of the LDA for the development of the provincial metropolis. Imran Khan said PTI has made Usman Buzdar Chief Minister of the Punjab so that the marginalized areas of the southern Punjab could be brought at par with the developed areas. Earlier, the Prime Minister was given a briefing by the Punjab government officials about the functioning and management of shelter homes. The shelter building is aimed at restoring the self-respect of those people who spend night under the open sky as well as broadening the circle of social responsibility by the state and citizens. The project will also meet the requirements of the needy persons by establishing safe places for them. Prime Minister Imran Khan had said that the government is committed to building a social net for the deserving citizens to ensure that everyone has a shelter over his head. In a tweet, he said he laid the foundation stone of first of five shelters for the homeless in Lahore on Saturday. The Prime Minister said the government is also committed to providing people access to health and education.